Comedian Eddie Cantor was wiped out in the great stock market Crash of October 1929 and wrote this little joke book about it so fast it was for sale before 1929 was over. He did a pretty good job of making money again, apparently, but it must have been a terrible shock.The book has no particular plot. It's just one joke strung after another, with some cartoony illustrations. There is a small amount of jarring racial humor.It's amusing reading (apart from that racial humor), but it's more like a transcript of someone's stand-up routine than the humorous essays of, say, Robert Benchley or James Thurber. 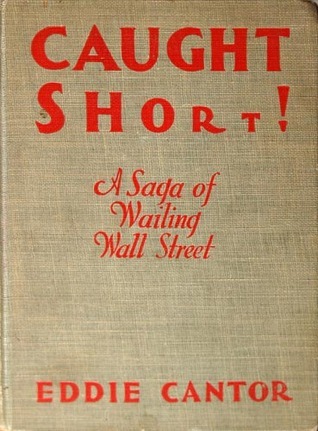 Eddie Cantor writing this book in 1929 would be the equivalent of George Clooney writing a book about how he has lost EVERYTHING in the stock market today: house, cars, money in the bank, everything. Very scary. Classic Crash of '29 HumorOld-school slapstick humor about the stock market crash of '29, from a successful comic who lost everything in it. If you like The Three Stooges and The Wall Street Journal both, this might be for you.